Pathologically, a spectrum of glomerular lesions can be seen, but mesangial proliferation with prominent IgA deposition is observed in almost all biopsies. See the images below. Light microscopy of a glomerulus from a patient with immunoglobulin A nephropathy showing increased mesangial matrix and cellularity. 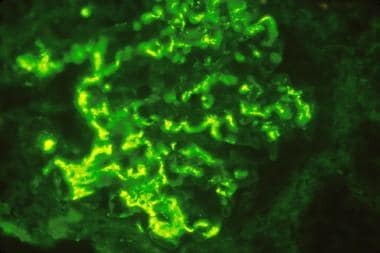 Immunofluorescence microscopy demonstrating large mesangial immunoglobulin A (IgA) deposits diagnostic of IgA nephropathy. Although IgA nephropathy is a limited nonsystemic renal disease, many systemic illnesses are sporadically associated with mesangial IgA deposition. Henoch-Schönlein purpura (HSP), a systemic illness, has been closely linked to IgA nephropathy. Other systemic diseases in which mesangial deposits of IgA are regularly observed include systemic lupus erythematosus, hepatitis, dermatitis herpetiformis, and ankylosing spondylitis. For discussion of this disorder in children, see Pediatric IgA Nephropathy. For patient education resources, see Blood in the Urine. For further information, see Mayo Clinic - Kidney Transplant Information. IgA nephropathy appears to result from an ordered sequence of events, starting with galactose-deficient IgA1, which contains less than a full complement of galactose residues on the O-glycans in the hinge region of the heavy chains. .These may act as auto-antigens that trigger the production of glycan-specific autoantibodies and the formation of circulating immune complexes that are deposited in renal mesangium. These then induce glomerular injury through pro-inflammatory cytokine release, chemokine secretion, and the resultant migration of macrophages into the kidney. Immune complexes formed by IgG or IgA antibodies with galactose-deficient IgA lead to deposition in the glomerulus. Deposited IgA is predominantly polymeric IgA1, which is mainly derived from the mucosal immune system. The association of some cases of IgA nephropathy with syndromes that affect the respiratory tract or gastrointestinal tract, such as celiac disease, led to the suggestion that IgA nephropathy is a disease of the mucosal immune system. This concept is also supported by the clinical observation that hematuria worsens during or after upper respiratory tract or gastrointestinal tract infections. The role of the complement system in the pathogenesis of IgA nephropathy is controversial. While IgA antibodies cannot activate complement through the classic pathway, studies have shown that complement can be activated by the alternate pathway. IgA nephropathy accounts for about 10% of biopsies performed for glomerular disease in the United States. Prevalence rates are lower in the United States than in Asian countries. These lower rates may be influenced by a conservative approach by nephrologists in the United States, who are reluctant to perform renal biopsies in asymptomatic patients with only mild abnormalities on urinalyses. Distribution of IgA nephropathy varies in different geographic regions throughout the world. IgA nephropathy is observed in up to 40% of all biopsies performed for glomerular disease in Asia, compared with 20% in Europe and 10% in North America. High prevalence rates are observed in Singapore, Japan, Australia, Hong Kong, Finland, and southern Europe, whereas low prevalence rates are the rule in the United Kingdom, Canada, and the United States. This disorder is thought to follow a benign course in most cases. However, many patients are at risk for slow progression to ESRD, which develops in approximately 15% of patients by 10 years and 20% by 20 years, though these percentages depend on how the disease is defined. 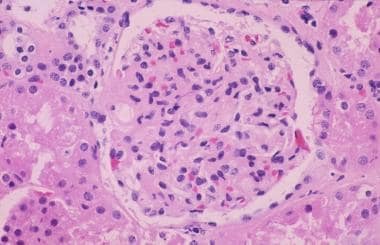 IgA nephropathy is more common in Asians and whites and is rare in blacks, both in the United States and in Africa. The condition is frequently observed in Native Americans of the Zuni and Navajo tribes. IgA nephropathy is more common in males than in females. Virtually all studies show a male predominance of at least 2:1, with reported ratios of up to 6:1. The higher male predilection is observed in white patients in northern Europe and the United States. IgA nephropathy can affect all ages but is most common in the second and third decades of life. Eighty percent of patients are aged 16-35 years at the time of diagnosis. The condition is uncommon in children younger than 10 years. C – Crescents: C0 (no crescents), C1 (crescents in less than one-fourth of glomeruli), and C2 (crescents in over one-fourth of glomeruli). A calculator for estimating the risk of progression to ESRD in patients with IgA nephropathy has been developed by Xie et al, based on a cohort of 619 Chinese patients. It has yet to be validated in other ethnic groups. The calculator uses four variables: glomerular filtration rate, hemoglobin level, serum albumin level, and systolic blood pressure. IgA nephropathy. Nat Rev Dis Primers. 2016 Feb 11. 2:16002. [Medline]. Cattran DC, Coppo R, Cook HT, et al. The Oxford classification of IgA nephropathy: rationale, clinicopathological correlations, and classification. Kidney Int. 2009 Jul 1. [Medline]. Coppo R, Troyanov S, Camilla R, et al. The Oxford IgA nephropathy clinicopathological classification is valid for children as well as adults. Kidney Int. 2010 Mar 3. [Medline]. Berger J, Hinglais N. [Intercapillary deposits of IgA-IgG]Les Depots Intercapillaires d''IgA-IgG. J Urol Nephrol (Paris). 1968 Sep. 74(9):694-5. [Medline]. Rodrigues JC, Haas M, Reich HN. IgA Nephropathy. Clin J Am Soc Nephrol. 2017 Apr 3. 12 (4):677-686. [Medline]. Knoppova B, Reily C, Maillard N, Rizk DV, Moldoveanu Z, Mestecky J, et al. The Origin and Activities of IgA1-Containing Immune Complexes in IgA Nephropathy. Front Immunol. 2016. 7:117. [Medline]. Fabiano RC, Pinheiro SV, Simões E Silva AC. Immunoglobulin A nephropathy: a pathophysiology view. Inflamm Res. 2016 Jun 28. [Medline]. McQuarrie EP, Mackinnon B, McNeice V, Fox JG, Geddes CC. The incidence of biopsy-proven IgA nephropathy is associated with multiple socioeconomic deprivation. Kidney Int. 2014 Jan. 85(1):198-203. [Medline]. [Guideline] Yuzawa Y, Yamamoto R, Takahashi K, Katafuchi R, Tomita M, Fujigaki Y, et al. Evidence-based clinical practice guidelines for IgA nephropathy 2014. Clin Exp Nephrol. 2016 Apr 20. 70:S56-62. [Medline]. [Full Text]. Magistroni R, D'Agati VD, Appel GB, Kiryluk K. New developments in the genetics, pathogenesis, and therapy of IgA nephropathy. Kidney Int. 2015 Nov. 88 (5):974-89. [Medline]. [Full Text]. Wyatt RJ, Julian BA, Baehler RW, et al. Epidemiology of IgA nephropathy in central and eastern Kentucky for the period 1975 through 1994. Central Kentucky Region of the Southeastern United States IgA Nephropathy DATABANK Project. J Am Soc Nephrol. 1998 May. 9(5):853-8. [Medline]. Walsh M, Sar A, Lee D, et al. Histopathologic features aid in predicting risk for progression of IgA nephropathy. Clin J Am Soc Nephrol. 2010 Mar. 5(3):425-30. [Medline]. [Full Text]. Shen PC, He LQ, Tang Y, et al. Clinicopathological characteristics and prognostic factors of asymptomatic IgA nephropathy. J Investig Med. 2010 Mar. 58(3):560-5. [Medline]. Haas M, Verhave JC, Liu ZH, Alpers CE, Barratt J, Becker JU, et al. A Multicenter Study of the Predictive Value of Crescents in IgA Nephropathy. J Am Soc Nephrol. 2017 Feb. 28 (2):691-701. [Medline]. Le W, Liang S, Hu Y, Deng K, Bao H, Zeng C, et al. Long-term renal survival and related risk factors in patients with IgA nephropathy: results from a cohort of 1155 cases in a Chinese adult population. Nephrol Dial Transplant. 2012 Apr. 27 (4):1479-85. [Medline]. Xie J, Kiryluk K, Wang W, Wang Z, Guo S, Shen P, et al. Predicting progression of IgA nephropathy: new clinical progression risk score. PLoS One. 2012. 7 (6):e38904. [Medline]. [Full Text]. Rollino C, Vischini G, Coppo R. IgA nephropathy and infections. J Nephrol. 2016 Aug. 29 (4):463-8. [Medline]. Scolari F, Amoroso A, Savoldi S, et al. Familial clustering of IgA nephropathy: further evidence in an Italian population. Am J Kidney Dis. 1999 May. 33(5):857-65. [Medline]. Ai Z, Li M, Liu W, Foo JN, Mansouri O, Yin P, et al. Low α-defensin gene copy number increases the risk for IgA nephropathy and renal dysfunction. Sci Transl Med. 2016 Jun 29. 8 (345):345ra88. [Medline]. Hahn WH, Suh JS, Cho BS, Kim SD. The enabled homolog gene polymorphisms are associated with susceptibility and progression of childhood IgA nephropathy. Exp Mol Med. 2009 Nov 30. 41(11):793-801. [Medline]. [Full Text]. Gharavi AG, Yan Y, Scolari F, et al. IgA nephropathy, the most common cause of glomerulonephritis, is linked to 6q22-23. Nat Genet. 26(3):354-7. [Medline]. Shoji T, Nakanishi I, Suzuki A, et al. Early treatment with corticosteroids ameliorates proteinuria, proliferative lesions, and mesangial phenotypic modulation in adult diffuse proliferative IgA nephropathy. Am J Kidney Dis. 35(2):194-201. [Medline]. Praga M, Gutiérrez E, González E, Morales E, Hernández E. Treatment of IgA nephropathy with ACE inhibitors: a randomized and controlled trial. J Am Soc Nephrol. 2003 Jun. 14 (6):1578-83. [Medline]. [Full Text]. Manno C, Torres DD, Rossini M, et al. Randomized controlled clinical trial of corticosteroids plus ACE-inhibitors with long-term follow-up in proteinuric IgA nephropathy. Nephrol Dial Transplant. 2009 Jul 23. [Medline]. [Guideline] Chapter 10: Immunoglobulin A nephropathy. Kidney Int Suppl (2011). 2012 Jun. 2 (2):209-217. [Medline]. [Full Text]. Floege J, Feehally J. Treatment of IgA nephropathy and Henoch-Schönlein nephritis. Nat Rev Nephrol. 2013 Jun. 9 (6):320-7. [Medline]. Pozzi C, Andrulli S, Del Vecchio L, et al. Corticosteroid effectiveness in IgA nephropathy: long-term results of a randomized, controlled trial. J Am Soc Nephrol. 2004 Jan. 15(1):157-63. [Medline]. Lv J, Zhang H, Chen Y, Li G, Jiang L, Singh AK, et al. Combination therapy of prednisone and ACE inhibitor versus ACE-inhibitor therapy alone in patients with IgA nephropathy: a randomized controlled trial. Am J Kidney Dis. 2009 Jan. 53 (1):26-32. [Medline]. Tesar V, Troyanov S, Bellur S, Verhave JC, Cook HT, Feehally J, et al. Corticosteroids in IgA Nephropathy: A Retrospective Analysis from the VALIGA Study. J Am Soc Nephrol. 2015 Sep. 26 (9):2248-58. [Medline]. [Full Text]. Lv J, et al; TESTING Study Group. Effect of Oral Methylprednisolone on Clinical Outcomes in Patients With IgA Nephropathy: The TESTING Randomized Clinical Trial. JAMA. 2017 Aug 1. 318 (5):432-442. [Medline]. Tang SC, Tang AW, Wong SS, et al. Long-term study of mycophenolate mofetil treatment in IgA nephropathy. Kidney Int. 2010 Mar. 77(6):543-9. [Medline]. Rauen T, Eitner F, Fitzner C, Sommerer C, Zeier M, Otte B, et al. Intensive Supportive Care plus Immunosuppression in IgA Nephropathy. N Engl J Med. 2015 Dec 3. 373 (23):2225-36. [Medline]. [Full Text]. Vecchio M, Bonerba B, Palmer SC, Craig JC, Ruospo M, Samuels JA, et al. Immunosuppressive agents for treating IgA nephropathy. Cochrane Database Syst Rev. 2015 Aug 3. CD003965. [Medline]. Fellström BC, Barratt J, Cook H, Coppo R, Feehally J, de Fijter JW, et al. Targeted-release budesonide versus placebo in patients with IgA nephropathy (NEFIGAN): a double-blind, randomised, placebo-controlled phase 2b trial. Lancet. 2017 May 27. 389 (10084):2117-2127. [Medline]. Dillon JJ. Fish oil therapy for IgA nephropathy: efficacy and interstudy variability. J Am Soc Nephrol. 1997 Nov. 8(11):1739-44. [Medline]. Liu LJ, Lv JC, Shi SF, et al. Oral calcitriol for reduction of proteinuria in patients with IgA nephropathy: a randomized controlled trial. Am J Kidney Dis. 2012 Jan. 59(1):67-74. [Medline]. Lafayette RA, Canetta PA, Rovin BH, Appel GB, Novak J, Nath KA, et al. A Randomized, Controlled Trial of Rituximab in IgA Nephropathy with Proteinuria and Renal Dysfunction. J Am Soc Nephrol. 2017 Apr. 28 (4):1306-1313. [Medline]. Klahr S, Levey AS, Beck GJ, et al. The effects of dietary protein restriction and blood-pressure control on the progression of chronic renal disease. Modification of Diet in Renal Disease Study Group. N Engl J Med. 1994 Mar 31. 330(13):877-84. [Medline]. Levey AS, Adler S, Caggiula AW, et al. Effects of dietary protein restriction on the progression of advanced renal disease in the Modification of Diet in Renal Disease Study. Am J Kidney Dis. 1996 May. 27(5):652-63. [Medline]. Vergano L, Loiacono E, Albera R, Coppo R, Camilla R, Peruzzi L, et al. Can tonsillectomy modify the innate and adaptive immunity pathways involved in IgA nephropathy?. J Nephrol. 2014 Apr 23. [Medline]. Kovács T, Vas T, Kövesdy CP, Degrell P, Nagy G, Rékási Z, et al. Effect of tonsillectomy and its timing on renal outcomes in Caucasian IgA nephropathy patients. Int Urol Nephrol. 2014 Sep 3. [Medline]. Maeda I, Hayashi T, Sato KK, Shibata MO, Hamada M, Kishida M, et al. Tonsillectomy has beneficial effects on remission and progression of IgA nephropathy independent of steroid therapy. Nephrol Dial Transplant. 2012 Jul. 27(7):2806-13. [Medline]. Watanabe H, Goto S, Kondo D, Takata T, Yamazaki H, Hosojima M, et al. Comparison of methods of steroid administration combined with tonsillectomy for IgA nephropathy patients. Clin Exp Nephrol. 2016 May 23. [Medline]. Yu L, Jiang L, Zhou XJ, et al. Common genetic variants in the chromogranin a promoter are associated with renal injury in IgA nephropathy patients with malignant hypertension. Ren Fail. 2010 Jan. 32(1):41-6. [Medline]. Clayton P, McDonald S, Chadban S. Steroids and recurrent IgA nephropathy after kidney transplantation. Am J Transplant. 2011 Aug. 11 (8):1645-9. [Medline]. [Full Text]. Baek CH, Lee JG, Park JH, Kim H, Yang WS, Kim YS, et al. The clinical outcomes of second kidney transplantation in IgA nephropathy: a multicenter retrospective study. Clin Nephrol. 2016 Aug. 86 (2):87-93. [Medline]. Trimarchi H, Barratt J, Cattran DC, Cook HT, Coppo R, Haas M, et al. Oxford Classification of IgA nephropathy 2016: an update from the IgA Nephropathy Classification Working Group. Kidney Int. 2017 May. 91 (5):1014-1021. [Medline]. Gutiérrez E, Zamora I, Ballarín JA, Arce Y, Jiménez S, Quereda C, et al. Long-Term Outcomes of IgA Nephropathy Presenting with Minimal or No Proteinuria. J Am Soc Nephrol. 2012 Oct. 23(10):1753-1760. [Medline]. [Full Text]. Le W, Liang S, Chen H, Wang S, Zhang W, Wang X, et al. Long-term outcome of IgA nephropathy patients with recurrent macroscopic hematuria. Am J Nephrol. 2014. 40(1):43-50. [Medline]. Electron microscopy showing large dark mesangial deposits. The authors thank Dr. Tim Timmerman, pathologist, for his invaluable help with the pathology slides.